The base fare is $1.25; however, Fort Wayne Citilink offers a wide variety of fares and passes. Exact change is preferred. If exact change is not available, you will be issued a "Change Card" by the farebox. This Change Card does not expire. Note that operators do not carry cash, nor can the farebox give change. Transfers are no longer available, passengers are encouraged to take advantage of the "All Day Pass" for unlimited rides all day. For any additional questions in regards to this matter, you can call Citilink at 432-4546 between the hours of 5:30am - 7:00pm. Special fares are offered to children and youth ages 5-18 years, persons with disabilities, senior citizens (age 60+) and Medicare card holders. Payment of special fares requires a Citilink or school issued picture ID card. There is a $3.00 charge for the Citilink issued picture ID. These ID cards are valid for three (3) years. 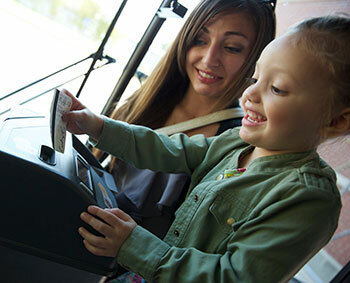 Customers with reduced fare ID cards must inform the driver prior to inserting cash into the farebox. Any patron not presenting an ID card will be required to pay the regular fare. No refunds will be given. Citilink picture ID cards are available from the office at 801 Leesburg Road during regular office hours M-F from 8:00am-5:00pm. Please bring proper documentation for proof of eligibility (per photo ID checklist). Proof of SSDI disability eligibility is adequate documentation for disability eligibility. Individuals who do not have SSDI documentation may complete the half fare disability application. For customers who pay cash fares, simply drop the coins in the coin slot or insert a bill in the bill slot. If you are paying a reduced fare be sure to show your ID to the bus driver before paying the fare. 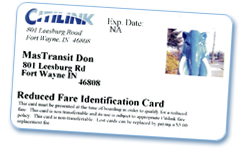 Citilink reduced fare photo ID cards are available from the Citilink office for $3.00 and are valid for three years. The fareboxes are designed to accept any bill up to $20.00. Let the driver know you are using a larger bill and the farebox can print a stored value "change" card that can then be used the next time you board. The proper amount of your fare will be deducted each time. Ask your driver for details. Transfers, Tickets to Ride, Ten Ride Cards, and Passes all have a magnetic stripe on them. These go right in the farebox (See graphic above). Explore the Fare tabs below to determine which one will work for you. This card provides unlimited use for the 3 months of the summer break (valid May 26 - August 15). This card retails for $25.00 and is intended for any child (ages 5-18) who would normally pay the child fare of $.60 to board the bus. A bus driver may request a school issued ID photo from the student if proof of age is necessary. This pass is good for the entire summer (approx. 90 days). Bus Passes and 10-Ride Cards can be purchased online or at the following locations: Citilink, Scott's Food Stores, Kroger, Urban League, Third World Store and the City Utility Office at Citizen's Square. Reduced Fare passes may be only be used to ride the bus if the user shows the bus driver a Citilink reduced fare ID card. Citilink Photo ID cards are available from the Citilink office for $3.00 each and are good for three years. Senior citizens must bring proof of age ID or Medicare Card and people with disabilities must bring evidence of SSDI eligibility or complete an ID application form. Youth must show a valid photo school ID.